Situps target your lower back muscles. A “calisthenic workout” is a fancy term that refers to body-weight exercises. Many exercisers appreciate calisthenics for their simplicity. There are no machines to figure out, weights to grasp, resistance bands to stretch or balls to balance on (and hopefully not fall off of). Calisthenics can offer a good total body workout. Limiting yourself to performing calisthenics on the floor does reduce your options, but still leaves you some good exercise choices. Many stretches typically performed while standing can also be accomplished on the floor. For example, if you stretch your quads by holding your ankle and bending your leg back against your rear end, perform the same stretch while lying on your side; lie on your left side to stretch your right quad, and vice versa. Stretch your hamstrings while lying on your back. Begin with both knees bent and your feet flat on the floor. Extend one leg and raise it as far as you can toward your body while keeping your knee straight. Perform a press-up to stretch your lower back by lying face-down with your elbows bent and your palms next to your shoulders. Raise your upper body and extend your arms while keeping your legs and hips in place. The calisthenics arena provides some of the best abdominal exercises you can perform, with or without other types of resistance. Standard situps target your lower back muscles and, to a lesser extent, your abs. Perform crunches to better target your abs by lying on your back with your knees flexed and your feet flat on the floor, then raising your head and shoulders. Make the exercise more challenging by raising your lower legs in the air first. Work your abs -- along with your chest, shoulders and quads -- by doing a front plank. Assume a pushup position, but balance on your forearms instead of your hands and maintain your position instead of pushing yourself up and down. You can also do numerous variations of situp, crunch and plank positions to target different areas. The pushup is another standard body-weight exercise with numerous variations. Perform a classic pushup by balancing on your hands and toes, then extending and contracting your arms to move up and down while keeping your upper and lower body straight. Make the exercise easier by balancing on your hands and knees, or make it harder by raising one leg, or performing the movements with one arm. Target you triceps by keeping your hands close together. Do a lying hip extension to target your glutes and work a variety of lower back, hip and thigh muscles. Lie on your back with your arms at your sides, one knee bent and one leg straight. Raise your extended leg and your upper body so your leg remains aligned with your torso. A side bridge hip abduction targets your outer thigh and your glutes. Lie on your side with your legs stacked on each other and balance on your lower forearm. Raise your hips and extend your upper leg as high as possible while keeping your bottom foot in place. 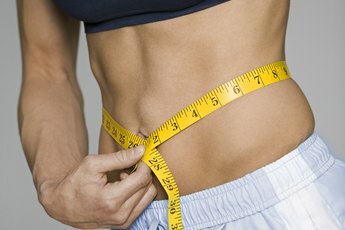 BodyBuilding.com: Sit-Ups or Crunches Which Are Better?